Looking towards the George Hotel and Compstall Mill. From the MLHS Archives. Jack Hadfield was a native of Compstall, the eldest son of Sam Hadfield. Together with other members of this large family he worked at Compstall Mill where he started organising Trades Unions. He was also a member of Compstall Urban District Council—the smallest in the country. 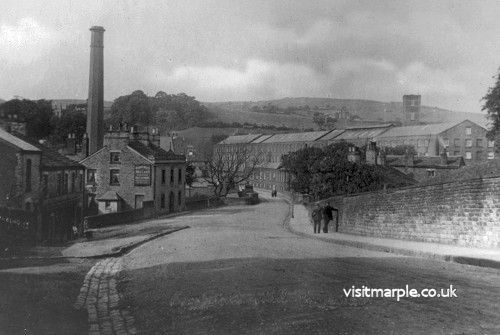 I am giving you a picture of Compstall and I will fill in some more details, especially connected with the life of the worker. To appreciate what is involved in this story a little imagination is needed and the ability to think oneself back again to those days when the stage coach was the principal means of travel, when candles and lamps formed a cheap means of illumination, education was the privilege of the few and newspapers a luxury. The fortunes of the village changed from farming to factory life. From about 1820 Mr George Andrew in Compstall turned his attention to the manufacture of cotton instead of dyeing. In 1830 hand spinning was dead, killed by the mule and spinning jenny. The power loom extinguished the home weaver and the result was many hungry, desperate men, men who saw no other way of remedying matters than smashing the machinery which took away their living. About 1826 or 1827 Compstall Mills had their scare and as a precautionary measure a large quantity of stones was taken to the top of the mill, to be thrown down if an attack was made. Happily nothing happened. The Lily Waterwheel (left) - Mr George Andrew had chosen a splendid site and made full use of the water supply. 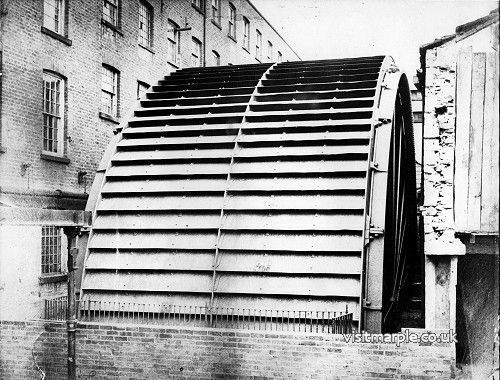 He caused to be erected a famous water wheel called The Lily and it began to work on June 4th 1838, the diameter 50 feet, width 18 feet, developing 276 horse power.The fall of the water to it was 43 feet. Of course there was an earlier wheel which worked the North Mill called the Old Josh but this was much smaller. 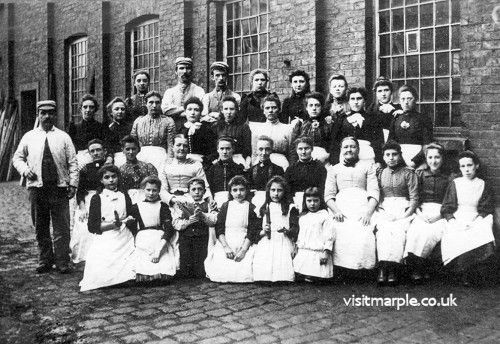 The conditions under which this industrial revolution took place were terrible - cheap labour - The cheapest labour was the child and into the factories went the children from the age of 6 years. They worked from 12-16 hours daily and sometimes at the end of the day the children fell asleep in the mill. The fathers carried them home and put them to bed.They were taken from bed next morning, still asleep, and were carried to work, to waken up at machines where they had dropped off. My first impact of all this - We went to work at 11 years of age, half time, and then back to school alternatively each week. I went full time at 13 years of age from 6.00’clock in the morning till 5.30 in the afternoon, Saturday morning till 12.30. Out of all these struggles the operatives got together to form a Trade Union. The first union that was organised was the Operatives Spinners Association, worked from Hyde District. Then the weavers amalgamated and joined the Weavers Association. Next came the card room operatives, who formed their own particular union and also the Overlookers union. Out of all these men and women getting together then came the question of buying their own groceries. So the various department managers called some of the workers together and formed the first co-op society. This was known as the Teapot; the first meeting was called and was held in a room at the mill. From those days, of course, the Co-operative movement played a big part in village life. Members and department managers formed the committee and they also appointed their own Manager. From those days the Co-op movement spread, of course, to the various Branches all over the districts. We came then to the inside conditions of the mill. I was appointed spinners’ representative fifty odd years ago. One of the first things we set out to improve was the lighting of the mill. In those days we had the bare gas burners, just the light, which caused quite a lot of the people to have bad eyesight and did these weavers suffer with bad eyesight! If they made any faults they had to pay a fine. In connection with the spinning section, the naked lights, as you bent over your mule, would burn your hair, just bending down and it was a great strain of eyesight. Then we went from the gas burners to incandescent mantles which made a great improvement and as years went on we came in for the electric lighting of the mill. I have talked of fines to different ope ratives but one particular instance happened where a family overslept and one member, being late six mornings out of the six, was sent home, in those days what they called “he was sacked.” With the impact of the trade unionist becoming a force in the mill life, improvements came about. We were able to obtain concessions that when your machine stopped you were paid your fall back wage. When any work was paused in the weaving departments the employers held themselves responsible and so compensated the weaver. 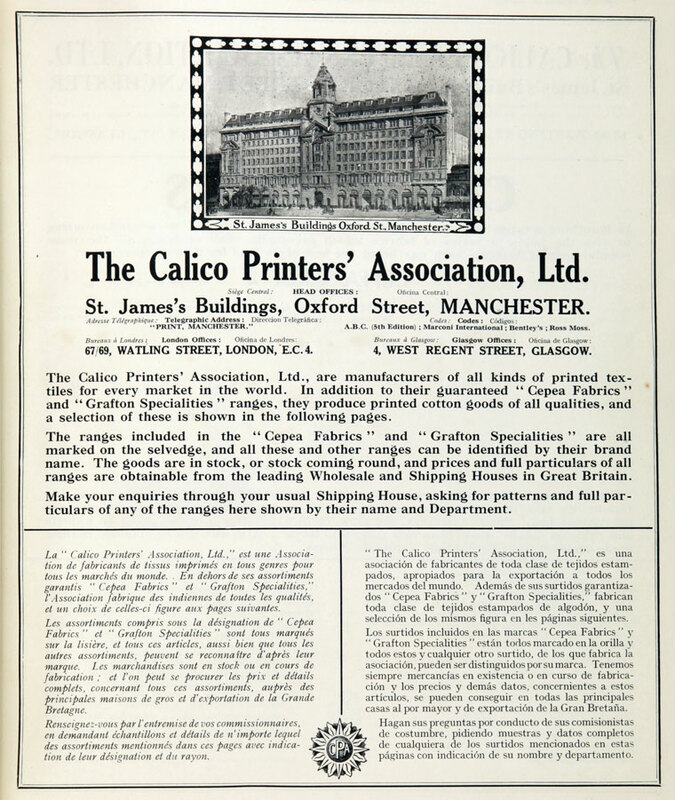 In my position as representative I came in contact with many other managers and workers of the Calico Printers Association. One official informed me that they paid a sickness and long service grant to their employees at a printworks outside the area so I brought this matter up with our local executive and interviewed the management. After several weeks of discussion we were allowed these concessions at Compstall Mill with this proviso that the manager of the weaving section would be the chairman and a representative from each department to form the committee.That was the beginning of the superannuation, the long service grants and the various gifts that have happened at Compstall. This was a great step for the people. As the operatives retired they were allowed so much per week which enabled them to buy coal and so on. This was fully appreciated by those who worked hard for better conditions. Inside the mill - took an interest in the village welfare but seeing that the CPA was the biggest rate payer and these men were operatives in the mill, the progress was somewhat limited. The penny rate only produced about £18 and in those days the village had no lights. One strong advocate fought for weeks and weeks at the council meetings for an extra lamp in the village. After considerable delay some more lamps were provided and the village lamplighter appointed. Then myself, being chairman of this Urban District Council who, by the way, was the smallest UDC in Cheshire, I was fortunate in being in touch as Chairman of the council and representative of the Spinners. So I was able to interview the heads at Manchester. They decided to do away with the village middens and install bucket sanitation. The fight after this was for water closets. In 1936 Compstall became a ward of Bredbury and Romiley Urban District Council. 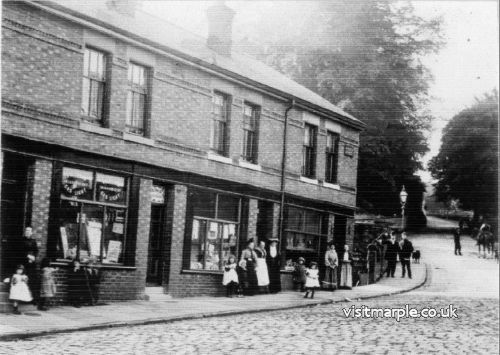 The village had been sold to a syndicate and to give Bredbury & Romiley their due they commenced a scheme whereby water closets are now installed in that village, also modern bathrooms, and so a big change has come about in the village life through the activities of staunch trade unionism. (above) Shops On Compstall Brow. Thanks must be given to Bill Beard, Ruth Hargreaves and Louise Thistleton for transcribing the memory recordings.